IMAGE: Dr. Maria Choi with Hall thruster Vacuum Facility-5, Glenn Research Center, Cleveland, OH. Photo: NASA/Rami Daud. University of Michigan alum Dr. Maria Choi (Ph.D. AE ‘16) is a young professional – less than two years into her career at NASA – but an accomplished one. The focus of her research at Glenn Research Center is Hall-effect thrusters, a developing technology in the field of electric propulsion. In 2011, Dr. Choi received the NASA Space Technology Research Fellowship (NSTRF) and the National Science Foundation (NSF) Graduate Research Fellowship, giving her the opportunity to research with Professor Iain Boyd at UM’s Nonequilibrium Gas and Plasma Dynamics Laboratory as a doctoral student. Dr. Choi feels that the disparity between women and men in the aerospace industry can be closed through outreach. During her time as a Ph.D. student, Dr. Choi was Co-director of the Graduate Society of Women Engineers (GradSWE) at the University of Michigan. 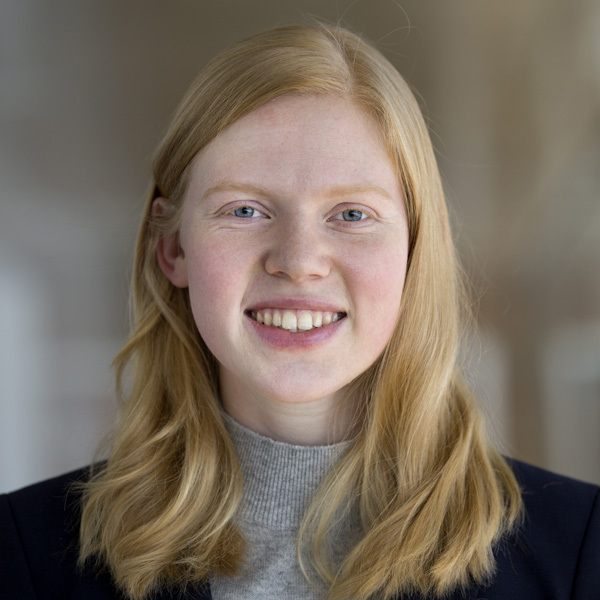 Before her 2015-16 co-directorship, she was GradSWE’s networking chair for three years. One of her main initiatives as networking chair was the introduction of the Female Faculty-Student Mixer, which brought together female engineering graduate students, faculty, and professionals from the Ann Arbor/Detroit area. Today, the event is one of GradSWE’s most popular events. 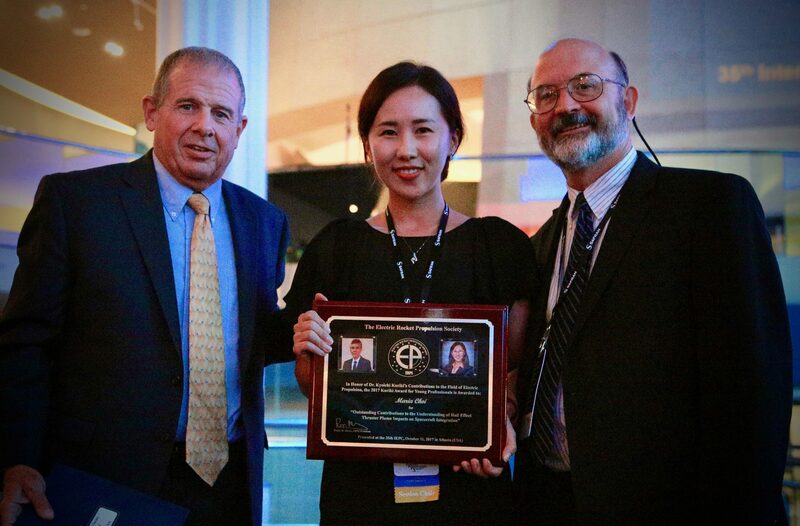 IMAGE: Dr. Maria Choi receiving the Kuriki Young Professionals Award in October 2017. Photo: Electric Rocket Propulsion Society. Ultimately, though, Dr. Choi is driven by her love for her field: “It was my dream job to work at NASA as an undergrad. I am finally here, and I just want to continue doing my best, contributing to and advancing this field. 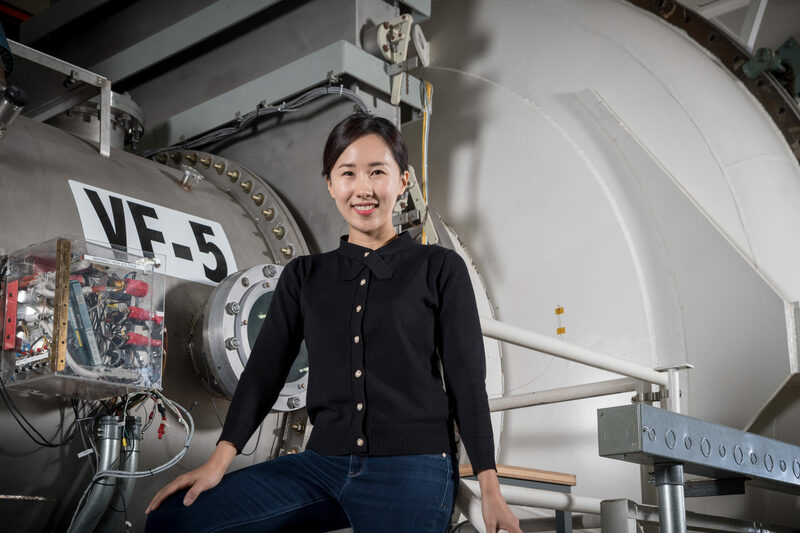 Being in this field, I’m living my dream, it’s very wonderful and amazing.” For her leadership and contributions to Hall-effect thruster research, Dr. Maria Choi is the first recipient of the Kuriki Young Professionals Award (2017) from the Electric Rocket Propulsion Society.